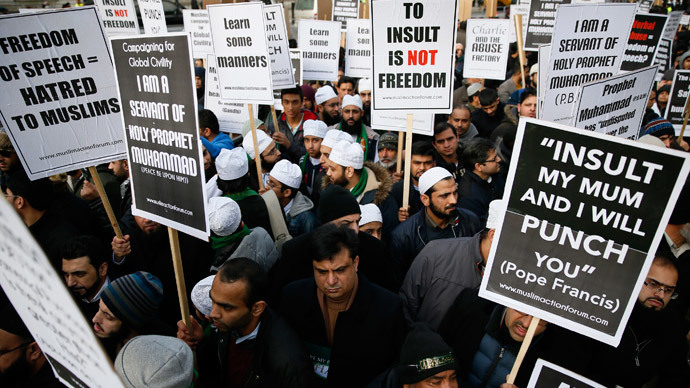 About 1,000 Muslims flooded central London to defend their faith from satirical attacks. They garnered 100,000 signatories on a petition to David Cameron, condemning both the ‘uncivilized’ slander of religious faith and the violence that begets it. Downing Street was awash with Muslim protesters insisting that comedic depictions of Prophet Mohammed won’t stand with them. They shouted slogans such as “Insult is NOT Freedom” and waved banners bearing ‘Stand Up For the Prophet,’ among others. The crowd included small children. One boy carried a banner with Pope Francis’s recent controversial statement that shortly after the Paris attacks appeared to see terrorism as Islam’s natural knee-jerk reaction to being offended: ‘Insult My Mum and I Will Punch You.’ It came as the Pope argued that insulting the faith of others should not fall under the rights afforded to people by freedom of speech. An accompanying petition denouncing the cartoonist’s work, signed by 100,000 British Muslims was submitted to Prime Minister David Cameron online. It called the cartoons “an affront to the norms of civilized society,” but also called on the government to realize that good Muslims worldwide wish to emphasize non-violent means of resolving such conflicts. The march started at the Cenotaph, the famous WWII memorial for fallen heroes and ended up blocking a substantial part of Whitehall. The event was marked by speeches and later, a prayer. Muslims weren’t the only ones who showed up. Far-right Brits aligned with the anti-immigrant Britain First party stood by not far away, with the police forming protective cordons to separate the two crowds. But reports indicate there were hardly more than a dozen of them. The attack on Charlie Hebdo, the Paris-based satirical magazine, left 12 people dead and has since sent shockwaves through the world, debating the extent of free speech, amid the wider threat of Islamophobia in the West and continuing war in the Middle East.